We are Lena (14) and Véronique (16) and for two weeks in June, we were interns at PTScientists. It’s compulsory to do an internship while in year nine or ten in Berlin and we chose PTScientists because we are both really interested in space and want to become astronauts when we are older. Our friends weren’t too surprised that we found a space-themed internship because we’re always talking about space. Some of them were pretty jealous – being nerds as well! Lena was first inspired by space when she read “George’s secret key to the universe” at school. It’s a book written by Stephen Hawking and his daughter Lucy. Véronique’s introduction to the subject came from her uncle, who enjoys astrophysics as a hobby. 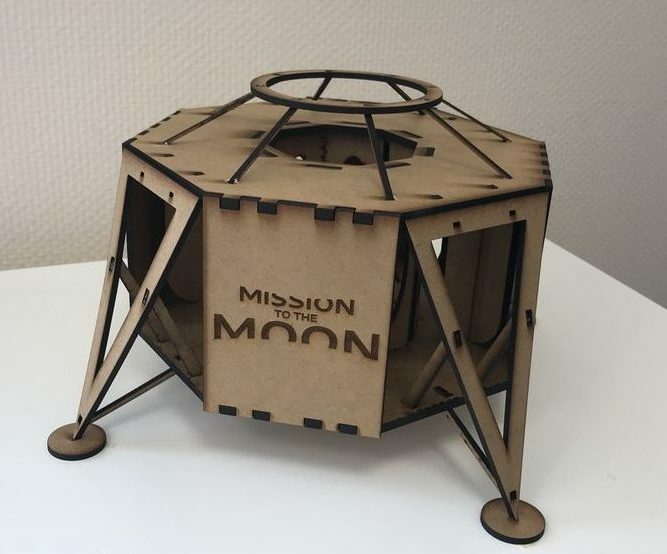 When we arrived at PTScientists we were given a project, which was to build a model of the spacecraft ALINA using a laser cutter. 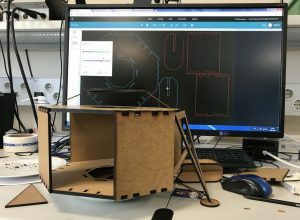 We started with creating a 3D model on the computer. Then we had to cut out all the parts out of wood using the laser cutter and put them together. Unfortunately, the parts wouldn’t fit together once cut out, a stage that we reached after five days of work. Therefore, we had to readjust them in our 3D model and then cut them out again, and again, and again..! After eight days, we had our model finished, cut out and ready to go into production! Well actually, not quite. We still had to check how many extra parts we would need if anything broke while assembling it and engrave the sides with the mission’s logo… but overall, we were finished. What we liked about this internship was…. everything! The laser cutter was pretty cool, and we liked, that we were allowed to do lots of things by ourselves and not just have to make coffee – something that we have heard happens very often during high school internships. We felt very independent and valued, something that isn’t always the case at our schools. The people working here are also really nice and helpful, on top of being open, and we were always happy to discover something new. To sum it all up, one can say that these were two truly amazing weeks where we learnt lots of new things and got to know many cool people. We both still want to be astronauts, but we’d consider astrophysics or space robotics too. We would definitely recommend doing your internship at PTScientists, to everyone who is interested in space, and science or meeting new and nice people in general!